Many years ago, in my first year or so as a critic, I reviewed a show and gave it the lowest rating (in those days we used stars; thank goodness we don't any more). It was Show Boat at the professional theater in town. At that time, they had "guest stars," B-list actors who were no longer "hot" in Hollywood, but who would perform at theaters around the country. The guest star in this production was Alan Young, the star of the TV show, Mister Ed (the talking horse). Mr. Ed had all the good lines, but Young was his owner, Wilbur, who made the perfect straight man. Mister Ed ended in 1966 and Show Boat would have been here in ~2000. A lot happened to Young in 40 years or so. In this production he played Cap'n Andy, the captain of the showboat and I realized early in the performance that he always had a chorus girl with him, who seemed to be steering him around the stage. He had difficulty with his lines and, in fact, the only scene in which he seemed well prepared is where Cap'n Andy is at a club and is drunk. There were other problems with the show, concerning the directing, and it made me so angry that I was very honest about my problems with the show. The critic for the Sacramento paper gave it five stars and praised it to the skies. I was just brand new and uncertain of my self, and, silly me, I thought I could get some insight from this critic about what he saw that I missed, so sent him a note and explained my status and my feelings an asked what he saw that I didn't. Instead of answering me, he was very dismissive, angry that I would dare question him, and said that he felt we needed to encourage productions of these old gems rather than pan them. It is now 17 years later and I am still uncomfortable even saying hello to him because I was so stung by how he treated me. But also, in the past 17 years, I have grown a bit more confident in my opinions and am not afraid to write them. Sometimes I disagree with my colleagues on the second paper for which I write. But what I have learned over the years that you have to take a critic's review with a grain of salt. Some will like a show, someone else will not. If you read reviews over time you'll get a feeling for which critics you trust vs. which have opinions that differ from your own. Around here, there are those who put a lot of stock in "equity actors." Those are professional actors who belong to Actors Equity, the union for professional actors. I am not clear on what exactly the benefits are of joining Actors Equity, but I know that they make certain the actors get the money they are due and probably have an insurance policy that goes along with it. But I also remember from my Lamplighters years, people who were equity class actors who chose not to join because if they did they would not be able to perform in community theater unless they could get a waiver from Equity to perform. So you had lots of excellent, equity-quality actors performing, but they just didn't join Actors Equity for their own reasons. Now, I don't know if anybody in the normal audience really pays attention to those little asterisks which appear next to the name of Equity actors in a program, but for some folks, Equity seems to be the be all and the end all. A critic I know is always pointing out to me that so-and-so is EQUITY, as if this ensures that his/her performance will be better than everyone else. But I've been around long enough to have seen bad Equity performances (witness Alan Young in Showboat) and above average performances of non-Equity people, like my friend Lenore, who I think toured in an Equity show once but then did not renew her membership because it severely hampered her ability to perform locally. It may be OK in a place like New York which has so much theater everywhere, but in the Sacramento area, work for Equity actors is limited. But we recently received a communiqu� from the head of a local theater, essentially taking us to task for reviewing non-Equity companies higher than his "all professional" company. He is justifiably proud of his stable of Equity actors and feels we need to give him credit for that. We were all kind of offended by that. I don't think any of us has reviewed anybody unfairly, whether unfairly favorably or unfairly unfavorably. I review shows by how the actors perform and what the script is like. I am not, unlike some, so impressed by the idea of an Equity actor appearing in a show that I will automatically review the show on a different level than a show that does not have Equity actors in it. In all honesty, this theater has presented some of the most memorable shows I have seen in the last few years. By the same token, some of the worst theater I've seen has been at this place. I think this entry has come out of my continuing indignation over what I feel is totally inappropriate action by this particular theater head. It won't change how I review his shows, good or bad, but if I have a choice of which show must get short shrift because there are too many shows to review on a weekend, I'm not going to bend over backwards to do anything for him either. And I just hope that I'm right -- that the average theater goer doesn't give a fig for whether actors belong to Actors Equity or not and just wants to have a good theatrical experience, even if it is by non-Equity actors. 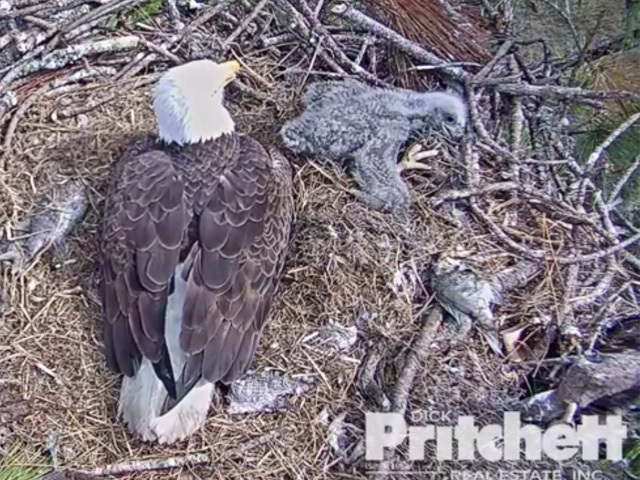 The baby is growing -- look at the size of those claws!